The musical surroundings in Leipzig, the city of Johan Sebastian Bach (or city of Mendelssohn or Reger), are without doubt unique. Step by step one encounters musical history: Thomaskirche, Nikolaikirche, Gewandhaus, Bach-Archiv, Mendelssohnhaus, University, Musical Instrument Museum, Middle German Radio Station - and even our own University of Music, the oldest one in Germany, founded by Mendelssohn himself in 1843. The confrontation with this history has an effect (consciously or sub-consciously) on always every musical action. Besides the rich tradition of renowned institutions such as the Bach-Archive, Choir of St Thomas, Gewandhaus Orchestra or Radio Orchestra and Choir, a lively and confident musical scene has emerged in the recent past. Among the Ensembles in this scene are the Male Quintet amacord, the chamber choirs amici musicae, Leipzig Vocal Ensemble, Josquin Desprez Choir, Leipzig Bigband, Schola Cantorum, Leipzig Baroque Orchestra, Salon Orchestra Cappuccino and many more. Furthermore there are many Festivals in Leipzig, such as the A-cappella-Festival, Bachfest, European Organ Academy, the concert-series musica nova of the pianist and composer Steffen Schleiermacher, Jazz-Festival, Tangofabrik or Moritzbastei. The lively Jazz and Small Art scene or the Leipzig book fare can inspire the same way as the International Bach Competition or the Gewandhaus Chamber Choir. For the students at the Church Music Institute, this close connection with many of these Ensembles, Institutions and Festivals is a true blessing. Leading figures in this rich musical scene teach at the Church Music Institute. 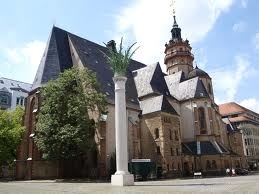 There is also a close relationship to the Department of Theology at the University of Leipzig. Dr. Martin Petzoldt, Professor Emeritus for Systematic Theology, has reconstructed the worship services from the time of J. S. Bach. Some Church Music Students hold part-time Church positions in Leipzig and many are involved in countless worship services and concerts in various churches throughout Leipzig. There is an impressive and unique landscape of organs in and around Leipzig, which, surprisingly, continues to change again and again. 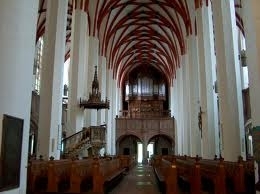 The Silbermann organs in Rötha (near Leipzig) or Freiberg, as well as the Sauer organ at St Thomas Church, attract visitors from all over the world. 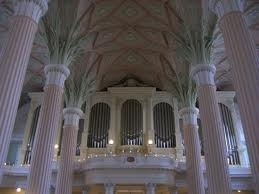 A few years ago, the restoration of the Ladegast organ at St Nikolai Church was completed to great critical acclaim. The two new organs at the University of Music, the historically inspired organ by Collon and the romantic instrument by Eule in the new Concert Hall, are hugely successful and complement the many historic organs in the area greatly.